Mother's Ring #2 by Landstrom's Black Hills Gold. This hand-crafted Mother's Ring is designed to last a lifetime ... and more! A mother's ring may well be the perfect piece of heirloom jewelry. 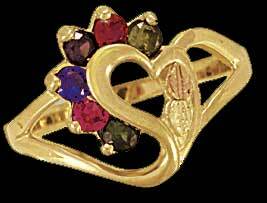 Mother's Ring #2 will accomodate from 2 to 7 genuine or synthetic 2.5 millimeter birthstones. If you have one child, you may wish to include your wife's birthstone or add yours, as well. 10 karat yellow gold shank and 12 karat rose gold and green gold grape leaves complete the Black Hills Gold look. Arrives in an attractive white clamshell gift box. Shipping is 10 working days or less. Basic pricing shown is for two synthetic stones. Each additional synthetic stone is $8 and each additional genuine stone is $16. Note: synthetic stones are not fake; they are chemically and physically identical to natural stones..